Jo Malone is such a popular kid on the internet, you can’t read a beauty blog without a very enticing review of one of her perfumes. So, like some kind of water torture chipping away at me, I’ve slowly become gripped by the idea of getting my hands on some. They are pretty darn pricey though, so what I didn’t fancy was spending £82 on a 100ml of something I haven’t tested out properly. Plus, I’m the one at a buffet that piles their plate high because they can’t quite choose between ALL THE THINGS. So after some fairly indiscrete hinting to my fiance (read: I emailed him a link), I was lucky enough to get the cologne ‘wardrobe’ for Christmas so I got to try out five. First up, the packaging. 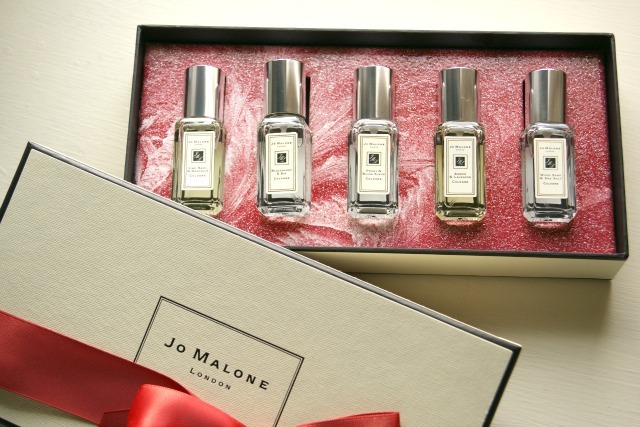 Obviously it’s pretty lovely, but you would expect nothing less from Jo Malone. As it was Christmas time, this is a festive edition which adds in a bit of red and that gorgeous red, glittery, solar systemesque background. Not sure of the right word to describe the bit that the perfume sits in, but that’s the bit I’m trying to describe. After a few weeks of furious spritzing and wandering around in a cloud of Jo Malone, I can now give a better description of the actual perfumes. The box I received contains Lime Basil and Mandarin, Blackberry and Bay, Peony and Blush Suede, Amber and Lavender and Wood Sage and Sea Salt. Lime Basil and Mandarin. This is considered to be a Jo Malone classic and sits within the citrus fragrance group. It has top notes of mandarin, but the basil and base notes of amberwood make this smell quite masculine to me. This isn’t my favourite fragrance on it’s own, but I’m not naturally drawn to citrus scents. A good one for combining with others to lighten them up. Blackberry and Bay. A very fruity scent and you can certainly smell the blackberry when it’s first sprayed! The bay leaves and cedar wood give the woody base notes and actually the blackberry isn’t too sweet. This is one which would be good to take on an exotic summer holiday. Peony and Blush Suede. My personal favourite! This is light and floral, with top notes of apple, mid notes of peony and a base of blush suede (whatever that is!?). Regardless of what blush suede is, this is my favourite every day perfume of the bunch. If you’re a fan of Stella McCartney’s Stella perfume, then you’d probably enjoy this. Amber and Lavender. This one is a mysterious, spicy and masculine scent. I’ll attempt to describe what it officially is which is top notes of pettitgrain (?!? ), a heart of lavender and base notes of amber. If you can imagine what this smells like from that list then I applaud you. I’m not entirely convinced by this one, but I’ll continue to experiment with combining it. Wood Sage and Sea Salt. Ahhh this is like a blustery beach walk and I love it. It’s fresh, with top notes of ambrette (again, I’m not going to pretend I know what that smells like), sea salt and a base note of sage (whoop – I know both of them!). It reminds me of summer, but more of a British, ‘could chuck it down at any moment’ sort of summer as opposed to a week in the Bahamas. As always, I really appreciate your comments. What are you favourite perfumes?